Usually we think of bathrooms when we think of slipping hazards in a home. Although a slip and fall accident is much more likely to occur in the bathroom, all flooring in the house must be considered when trying to make a house as safe as possible for a senior. Unless maintenance is not a concern (e.g. you have maid service) you may want to try to strike a balance between safety and maintainability. The safest flooring for seniors is one which is both non-slippery and soft in case a fall occurs. The obvious choice is carpeting, especially for living rooms, but another option is cork. Cork has good gripping quality and provides a relatively soft landing in case of a fall. It’s easy to clean but it’s it can be easily gouged or torn by furniture or sharp objects. It can also very susceptible to water damage so it definitely shouldn’t be installed in bathrooms. Linoleum is another reasonably safe option as long as adequate padding is installed between the floor and subflooring in case of a fall. Linoleum is easy to clean and it’s not very susceptible to water damage especially if rolled linoleum is installed. 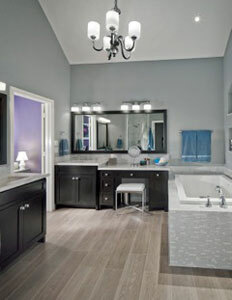 person in your life please give USI Design & Remodeling a call at 972-206-0750 in Dallas or 817-319-1892 in Ft. Worth.